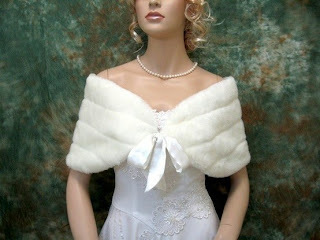 Since I am having a winter wedding, I want to wear a shawl or scarf during the photos that will be taken outside. I was set on a fur shawl like the one below I found on etsy. I imagined wearing this for only a couple hours, just to keep warm. But after watching the royal wedding I fell in love with Kate's jacket she wore with her second dress. I could do multiple blog posts on the royal wedding. I loved watching every second of it and yes I did get up at 4:30AM to see it live! Now I want to find a cute jacket like Kate wore...I am on the hunt! The dress was so lovely. What I like about it is the flowing effect makes it so elegant. I also got married in the winter and used a shawl :) But I love the little jacket that the princess used! Cuuuutee!!! PS: Check out my giveaway for the brides-to-be!